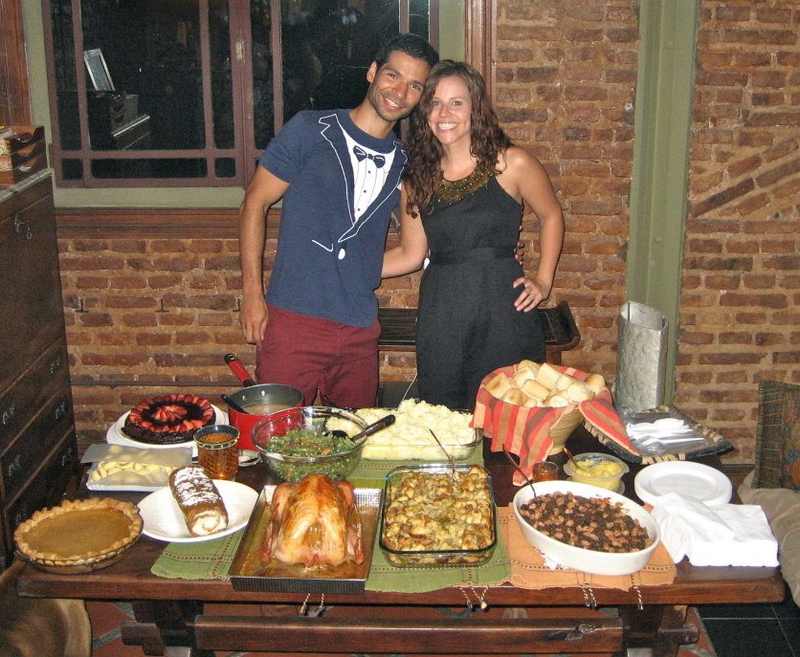 Hosting our first Yanqui Thanksgiving in Buenos Aires. Yes, that’s a tuxedo t-shirt. There’s not a whole lot I love more than hosting a dinner party. I’ve been playing hostess since grade school, so by now I can cook Thanksgiving dinner for 15 without breaking a sweat. Unless there’s a spring heatwave in Buenos Aires and the oven’s going all day…but even then, I prefer to see it as more of a glow. Whether we were sitting on the floor eating out of our laps in Philadelphia, or seated around the dining room table in Chicago (like grown-ups, finally! ), the dinner party protocol’s proven pretty standard over the years and miles. Plan a menu, invite people, they offer to bring a dish/dessert/wine, adjust the menu accordingly (or if you’re a menu control freak like me, just tell them to bring wine) and so it goes. 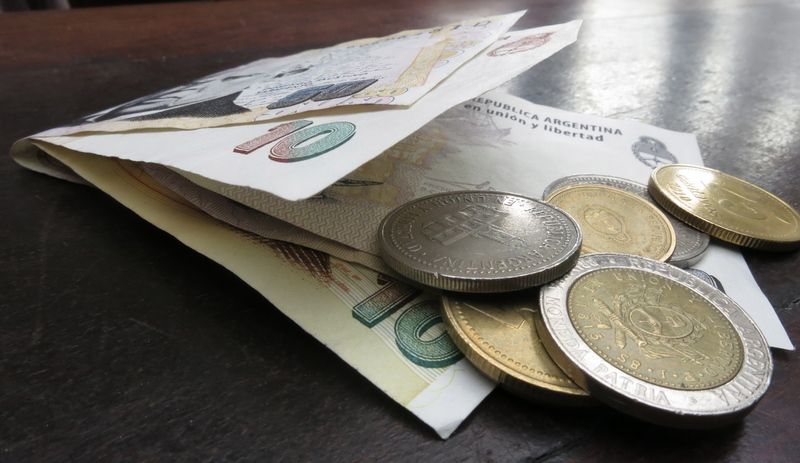 But then we moved to Buenos Aires. In addition to the fact that people in our beloved adopted country eat at an hour that most yanquis would consider freakishly late (most restaurants don’t even open until 8pm or later) I quickly learned that expectations may be a bit different here. We were lucky enough to be invited to have dinner at the home of one of my husband’s co-workers before a night of salsa dancing, and she was kind enough to send me an email explaining in great detail how the night would go down. Seriously, she even advised me on proper footwear. LOVE HER! She also let me know that there was no need to bring anything. Instead, the standard practice is for the host to take care of everything, advise the guests how much it cost, and we’d each be responsible for paying the host for our portion after the meal. Not that I mind whatsoever paying for my portion of a meal, and not that I mean to imply there’s a problem with this practice…but I just really didn’t know what to do with it. It goes against every fiber of my being to show up at someone’s home for dinner empty-handed. (We still ended up bringing a bottle of Fernet, I just couldn’t help myself). I’ve just always loathed the awkwardness of dividing up a bill after enjoying a meal at a restaurant with friends. Not to mention, I’m pretty bad with numbers in English. So in Spanish? Forget about it. Why does this make me so uncomfortable? To be clear, I recognize that this is simply a matter of different frames of reference. I have no problem accepting bottles of wine from guests, but if they offer me the equivalent in cash, it somehow gets weird. But it’s totally the standard here, so as they say, “es lo que es” and I’ve gotten used to it. Comfort zone: departed. Horizons: expanded. Though when I’m hosting we eat earlier, everyone’s instructed to bring wine and there’s no exchange of money. I can adjust to most of the customs here, but I just can’t bring myself to tally the bill for a dinner party. Yanqui hostess, yanqui rules. Hostess gifts from our Thanksgiving dinner guests. 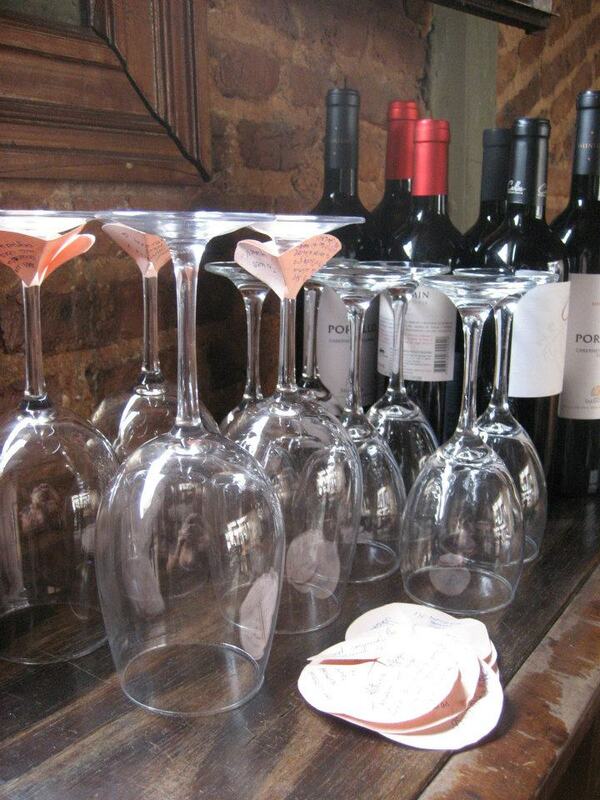 No more drinking wine from plastic cups! No way, amazing! Great minds and what not. Crazy!